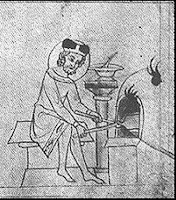 The thin flavored batter was poured into hot wafer irons then heated over coals on hearth, oven (c1340 image above), brazier (chafing dish) or 'stove'. 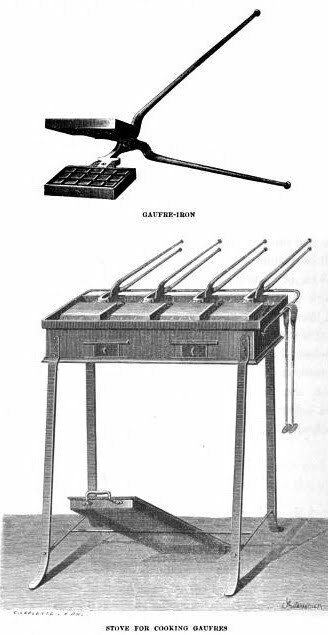 A later stove with wafer irons was illustrated in the 1874 cookbook by Gaufres. A few recipes from 1724 (Nott) and 1796 (Menon) to the 19th century are given. Shape when done: roll hot wafer around a rolling pin or knife to make the shape as seen in the first painting or to make a cone (below) filled with whipped cream. These are prepared like Cigarette Wafers, except that they are filled with whipped cream (Fig. 21). Lay the Wafer-Iron on the Furnace, so that when the Wafer is bak'd on one Side, it may be turn'd upon the other. Open your Iron a little, and observe, if it be come to a good Colour, it is enough : And at that instant take off the Wafer from the Iron with a Knife, rolling it a little round the same. Last of all, spread the Wafers hot upon a wooden Roller made for that purpose to shape them, and set them in the Stove, as they are finished, that they may be kept dry. Take three new-laid eggs, beat them with as much flour as they will absorb, some green lemonpeel, some orange-flower water, and some fine sugar; then beat in a little more than a gill of cream, and, when your paste is ready, heat the gauffre-iron* upon a stove, and rub it within with a bit of wax candle, to prevent the cakes from sticking: when your iron is hot, put into each square full a kitchen spoonfull of paste ; then shut your iron, and set it upon the stove : when your gauffres are done on one side, turn them on the other, and then take them out, and put them upon a wooden rolling-pin : bend them while hot, and, when they are quite done, put them into a dry place, till you have occasion to use them. You may keep them in a warm room several days before they turn soft. 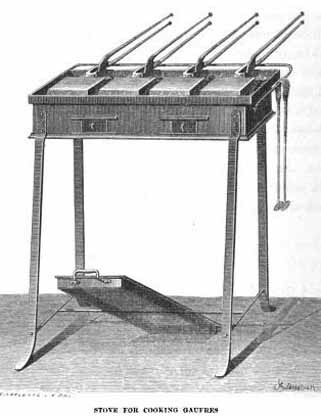 * An iron frame divided into several little squares. Put ½ lb. 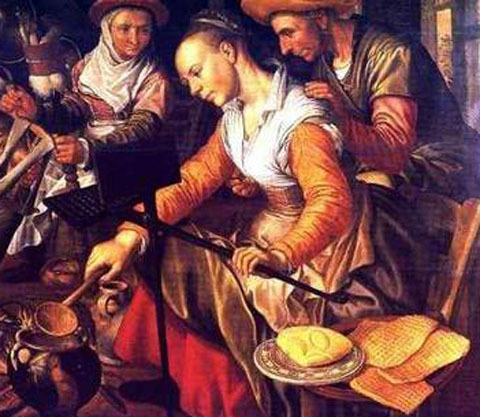 of butter in a basin to warm so as to soften the butter, and work it with a wooden spoon; work in 5 eggs, one at a time, and mix in, by degrees, ½ lb. of sifted flour and ½ pint of milk, until a smooth and soft paste is obtained. When all the gaufres are cooked, sprinkle them with pounded sugar, dish them on a napkin and serve them hot with a boat of whipped double cream flavoured with Vanilla Sugar. Fine French Wafers, or Gaufres. Take an earthenware pan, and put into it eight ounces of the best flour, six ounces of the best butter, and four ounces of pounded sugar. Rub the butter, flour, and sugar well together, then add the rinds and juice of two lemons, and three large eggs. Mix all thoroughly together with a wooden spoon until the paste is fine and smooth, then roll out your paste into little cakes; take your wafer tongs, heat them over the hole of a stove or clear fire, grease the inside surfaces with a small piece of butter or a little olive oil. Now put the paste in, and close the tongs; put the iron on the fire and turn the paste from time to time, in order to bake both sides the same colour. When it is baked, unfasten the tongs, scrape the edges, take out the wafers, and roll them on a small round stick, put them on a sieve and dry them in a stove. Put into an earthenware pan eight ounces of the best flour, with five ounces of pounded sugar. Mix it up into batter with the whites of six eggs and the juice of one lemon, thinning it with a little orange-flower water until it is quite smooth; then strain it through a hair sieve. Then flavour it with vanilla, heat the wafer tongs, butter the inside surfaces, then put in a spoonful of the batter and close the tongs immediately. Bake them in the same way as other wafers (see French Wafer). 1565 'A Dutch Kitchen Scene' by Joachim Beuckelaer in the Treasurer's House, York.